All Replies on The right 6" Jointer? if space is that limited I’d consider buying an old Stanley 7 or 8 and going the handplane route before buying a benchtop. if space is that limited I d consider buying an old Stanley 7 or 8 and going the handplane route before buying a benchtop. I bought a Porter Cable 6” bench top jointer last year off of Craigs List for $150 and I am very happy with it. At first I was not impressed but discovered that (1) the blades were very dull, probably because the former owner used it to strip off white (titanium) paint from some wood (there were chips still stuck in the exhaust shoot) and (2) the blades were set at the wrong height. Once I got sharp blades and set them correctly, it works very well. I hook up my shop vac to the exhaust port and it captures 99% of the chips. It can handle even some really hard hickory that I milled myself from a dead tree and leaves a glass smooth finish on it. My only complaints are that the fence is a little fidgety to get set correctly, possibly because I bought it used, and the aluminum tables are a little annoying because they have intentionally milled grooves in them. I was actually trying to find the G0725 that you are leaning towards because I think that the cast iron table would be a definite improvement over the PC’s aluminum ones. For just $100 more I would go for the one G0821 with spiral blades but it looks like they are out of stock at the moment. I would ask them when they expect more. I think that Cutech makes one with spiral blades as well that is comparably priced with the G0725 but I have no experience with it. I have a 6 inch floor standing Ridgid, I added a spiral carbide cutter head a couple of years ago. That was a wonderful upgrade. If you can afford the spiral carbide cutter head, buy it. Prior to this jointer, I had a Delta benchtop unit. As someone told me back then, it’s great if you build bird houses. I got rid of it after a short while. I highly recommend a free standing jointer if you can afford it and have a spot for it. As for which jointer, the basic ones, like mine, look pretty similar. Well, respecting the bench top requirement, then the G0821 would seem to me to be the clear choice. Yes it’s $120 more, but that $120 gets the 3 row spiral head with carbide inserts and the relative advantages of that. While it would be nice to have cast iron top/fence, I suspect that as a bench top unit you’re probably going to have to clamp it to the work surface no matter what. In which case the weight/mass is less of an issue. On the other hand, no cast iron also means no surface rust to worry about either. I’d also be thinking about noise levels with the 2 knife cutterhead. I had the basic grizzly bench top for a long time. It worked great on boards up to about 4feet. Hard to go wrong for the price. 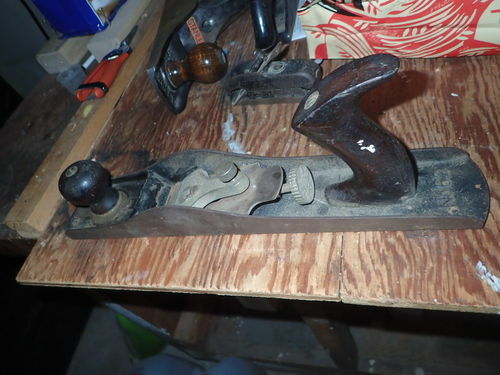 Wait, he casually mentions he has a hand plane…then throws up a pic of a Stanley 62? lol, that could be sold and prolly pay for a nice 6” jointer. That is a nice plane! I have the Cutech 6” benchtop with the spiral head and insert cutters. Quite nice small machine as long as ya don’t get too aggressive with long workpiece and really aggressive depth of cut. Aluminum beds, but that has not been a detriment. Haha! Yeah :). I’m not going to sell that one. The plane guy at a local shop keeps hounding for it too. I have the Cutech 6” benchtop with the spiral head and insert cutters. Quite nice small machine as long as ya don t get too aggressive with long workpiece and really aggressive depth of cut. Hadn’t looked at that one before so thanks for the plug. I’ll check it out. I was ordering the Grizzly benchtop jointer with the spiral cutter, but they were out of stock and no info on when they would be available. So I went with the Cutech, and I’m glad I did. I don’t know what the Grizzly would have offered for the extra $100 it would have cost. It’s about two months now, and I’ve run quilted maple, walnut, sapele and a few other woods with excellent results. Quick, quiet (relatively), and smooth. I did had to level the infeed and outfeed tables, which was quite easy after I read the manual. It was good to have to do that and get acquainted with the machine.